Hello friends! As many of you know, every month I do a “Brewer’s Challenge”, but last month I had an additional challenge for myself. I decided that I would help someone reach Master who had not yet done so. I am sure most of you know Geoquake, the Reddit/Discord mod. Although Geoquake is clearly very involved with the game, he spends a lot more time with Eternal players than Eternal cards. My goal in doing this (aside from the benefit of helping someone reach Master) was to take an in-depth look at mid-level play to find out what differentiates it from higher-level play. I learned a ton from this, though the most important lesson was that mid-level players tend to make the exact same kinds of mistakes as high-level players, just more often (or more badly). If you are someone who wants to improve your game this article is for you! I have distilled things down to 5 points. Not every one will apply to every player naturally, but I expect most will actually apply to basically everyone. To begin with I wanted to address a misconception I see regularly from the community…. As a foundation to all the things I will talk about is the understanding that skill is an essential component of winning games. I am sure you have all seen the forum posts, or watched people go on rants in Discord about how Eternal is all about top decking, and getting the right match ups, so skill is irrelevant. This narrative is deeply flawed in a number of ways. I don’t want this entire article to be about why skill matters, so I will try to run down some of the major points quickly. First, everyone makes technical play mistakes. Literally everyone. I watch a lot of different streamers, and all of these streamers make play mistakes. I am also not talking about just small mistakes like slightly mis-sequencing power or missing a point of damage in a control mirror. I am talking about serious errors that could realistically change the outcome of the game. I am not trying to say streamers are bad, I am saying that even people who are playing 20+ hours a week at high level Master can punt away games. My article last week as well as LightsOutAce’s article both focused on decision making and technical play in the ETS Invitiational. If people are making important mistakes when competing in ETS invitationals or while streaming in high level Master I promise you are making mistakes in your ladder play no matter who you are, and some of those mistakes are costing you games. “But Neon! What about those games where I get power screwed! Or a really bad match up! Those games are unwinnable! !” Yes, those games exist, but that doesn’t invalidate the many games that are winnable. I think it is more useful to view this as a spectrum. When you hit the “play” button in game you theoretically have a 50/50 chance to win the game you will eventually play (assuming you are playing a functional deck). As soon as you are paired and the cards are drawn your chance to win has already shifted to something totally different. The figure below runs down the different possibilities of what can happen. The first category of game are those where one player doesn’t have a functional hand. 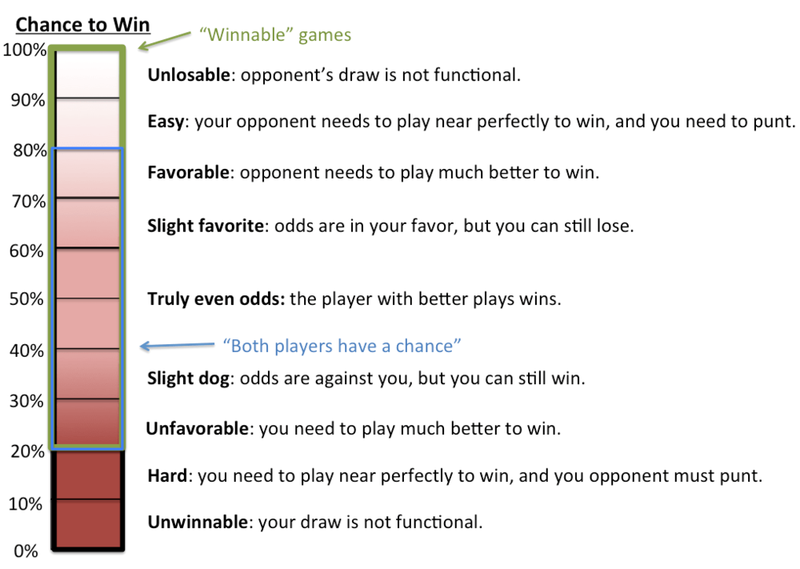 I would guess that in maybe 10% of games one player has a dysfunctional hand, so between you and your opponent 20% of games one player does not have a functional draw. I personally think this number is closer to 5% per side rather than 10%, but for the purpose of the exercise we will use 10%. I will fully agree that these games are not interesting or skill intensive. Next we have another 10% of games where you have a massive advantage and another 10% where you are at a massive disadvantage. A “massive disadvantage” would be like running into a bad match up with a functional, but below average draw. These games are theoretical winnable, but your opponent needs to punt horribly. Though these games are usually not particularly interesting, I think many people dismiss them as entirely inevitable. I have played plenty of games where either my opponent or I somehow miraculously draw out of an abysmal position. Still, I will admit that these games are not particularly compelling the vast majority of the time. The next category is games where one player has a clear advantage from the start, but this can be overcome. An example would be something like Rakano versus Armory where both players have functional hands. Rakano can win these games, but it is really tough, and they need to create opportunities for Armory to mess up. Once again, I think people dismiss these games as “inevitable”, but I strongly object to this. Take Unearthly’s stats playing Rakano for example. These are outdated, but you get the point by looking at them. Unearthly had a 44% win rate playing Rakano versus Armory, which is not favorable, but is certainly not “inevitable”. He even still has a 32% win rate when going second! Clearly he is at a disadvantage in his games against Armory, but knowing the matchup and playing it well certainly counts for something. In fact, I think that this is where the best players need to pick up a lot of their percentage over the field. If precise play and refined deck building can turn a 30% matchup into a 40% match up, that is a big gain. The “Favorable/Unfavorable” range makes up about 10% of the possibilities for each player, once again counting for 20% of total games. The middle range includes everything from slight favorite to slight underdog. Being a slight underdog would be something like a mirror match where you have an average draw and your opponent has an above average draw. I hope I don’t need to argue that these are skill intensive, and are often decided by the person who makes the better decisions. I would guess that the range of “slightly favored to slightly unfavored” is about 40% of the games played. Another important point – skill can often look like luck. When you die to a top-decked Obliterate the turn before you were able to close out the game it feels a lot like the game was totally determined by luck, but you are forgetting about all the decisions that happened to that point. Maybe your opponent sequenced their threats and reactive spells perfectly to get you to 6. Maybe they fired off pump spells for damage right before the window for combat closed. Maybe they correctly rationed resources to give them the last draw step they needed. Maybe you gave up life points earlier or gave them too much time. Yes, it was clearly lucky that they drew the Obliterate on the last possible turn, but what decisions were made up until that point to allow them to get lucky? Ok, I have gone off on this rant about skill in Eternal, but why does it matter for getting better? If you don’t accept the fact that you make play mistakes you will never get better. If all your losses are solely the result of drawing badly, getting the wrong match ups, or your opponent top-decking, how will you grow as a player? In order to get better you need to look for your own mistakes rather than excuses for how you lost. As I said above, there clearly are some games where there was nothing to be done, but you need to look as hard as possible to find ways to improve. Even when you are near certain to lose you should push yourself to try and find the 1-outer that gets you the victory, and play to that out. It is reassuring to write things off to variance, and it feels a lot harder to do serious introspection, but I promise that only one of these will lead to growth. This point has a simple version and a more nuanced version. Let’s start with the simple version: you will not get better if you don’t practice consistently. Most people I know who don’t consistently make Master simply don’t play enough. I expect most Masters level players average at least an hour of player per day. If you play more you will get better. Even if you are someone who has a ton of experience with card games you should be practicing nearly every day. That is the only way to keep your instincts sharp, your knowledge of the meta current, and your sequencing fluid. Ok, that is the simple version. I want to talk now about what it means to “practice”. A lot of people will read that and simply think it means just playing, but that is not exactly right. Take the extreme example of playing Gauntlet for 6+ hours a day. Aside from being incredibly boring after a certain point, I doubt you will be gaining any useful experience for the majority of that time. Practice should be deliberate and challenging in some measure. Take an example of a concert violinist. They practice every day to keep their skills sharp, but they are not just jamming whatever they want. They will focus on particular pieces they find challenging. They will work on new songs to expand their abilities. The objective of their practice sessions is not to spend 3-4 hours a day doing the bare minimum to say they “practiced”; rather they are focused on actually making it difficult so they can improve. If it doesn’t feel challenging it isn’t really practicing. If you are not practicing you will not get better. So what does practice look like then? Well, it depends on the player to an extent. For ladder play you can try playing new and different decks rather than going back to the old standbys (this is part of the reason I do the Brewer’s Challenge). You can have a friend watch your games and you can discuss difficult plays as they occur or after a game is done. Another exercise is trying to remember all the plays throughout an entire game. Having a good memory for play sequences is useful for predicting plays in the future as well as inferring the contents of your opponent’s hand, so working to recall the entire sequence of plays in a game is very useful. Pairing off with someone and doing sets of games focused on a specific match up can be extremely useful as well. You may think you know a match up well, but if you actually sit down to do a 10 game set you may be surprised by what you learn. This is all magnified many times over if you are interested in tournament play, where you will need to test sideboarded games with different configurations on both sides of a match up. This may all sound like a lot of work, and may just be stressful, but it is possible to have fun while doing this. While coaching Geoquake we were able to joke around between games, or celebrate when things broke our way, while still being focused on improving. It is possible for games to both be serious and fun. If they are not at least a little bit serious, though, you are probably not improving. I could not agree more. You get over a minute every turn to think through your plays. I am not saying you need to use all of it every turn, but you should at least use enough that you think through basic possibilities. I still can’t believe the number of people who attack Initiate of Sands into my ambushed Ayan on turn 3 without taking a moment to pause, or get blown out by what seems to be obvious tricks. If my opponents were taking their time, they might not throw away cards this way. In fact, a very good method to improve your skill is always coming up with the 3-4 most likely plays out of your opponent before you take any action. Let’s say you are against Praxis and you are going into their turn 4. You know that Titan and Firemaw are real possibilities, while Obliterate, Shatterglass Mage and Predatory Carnosaur are still a little bit off. How does this influence your plays? Maybe it has no impact, but at least you thought about it to avoid playing into obvious counters. One major benefit of taking your time on every turn is helping to stay on top of complicated decision-making, especially in situations like board stalls. Navigating board stalls is difficult, and many players will just turn off their brains and assume combat is impossible once things get a little cluttered. If you are constantly keeping up with processing the board rather than trying to do it all at once you will be better able to navigate blocks and attacks. What do I mean by this? Well, you should have a plan for what to do if your opponent does an A+space attack. If you have already figured out what some of the possible blocks are, it will be a lot easier to respond to changes. Beyond this, you should begin figuring out what to do in the most likely scenarios. For example, let’s say you are in a Time mirror and the board is stalled out. What is your plan if your opponent alpha attacks? What is your plan if your opponent removes your biggest blocker and attacks? What is your plan if your opponent plays an Obelisk? What if you draw a removal spell or an Obelisk? It is obviously impossible to have tactics in mind for all possible situations but by taking a bit of time every turn to process new things that come onto the board it is much easier to stay on top of everything that is going on rather than trying to suddenly catch up with what is happening once your opponent alpha strikes. I speak a bit more on how to navigate board stalls in this article and LightsOutAce touches on the topic in this article. In the interest of full disclosure I should admit that I struggle with this a good deal. When I get into the flow of laddering I play pretty fast, and if I begin to get tilted that quickly becomes straight up sloppy. I am working to force myself to slow down and actually think through my plays with more care, and even take breaks when I am getting frustrated. When I do play at a deliberate pace I am more likely to notice unusual lines of play, or be better prepared for my opponent’s counter-play. This is almost a subset of playing slowly, but is a common enough mistake that I wanted to separate it out. The order that you play cards matters. When you play cards matters. Improper sequencing will telegraph the contents of your hand or leave you vulnerable to counter-play. Let’s go through some quick rules of thumb. Map out the entire sequence of plays for your turn at the start of your turn. Don’t do anything until you have as much planned out as possible. I constantly see people get half way through their turn when they realize they needed to Seek Power first, or they have priced themselves into a an awkward line of play. Any leak like this could easily cost you a few percentage points in a given game. Like I said above – slow down. Play units after combat unless they have charge or some other ability that affects combat. If you are the aggressor it is correct to play Instigator before combat to deal extra damage (assuming you have no relevant tricks in hand you are powering down for). Playing units out pre-combat will give your opponent information about whether to trade, chump, or use a removal spell. Even when you don’t think it matters, it could easily matter to them for reasons you don’t yet know. When you give up information for free it give your opponent and advantage. Know the power/influence requirements of your deck, and the balance of different influence in your deck. I constantly see people make mistakes around influence requirements, where they unnecessarily either set themselves back a turn or cut themselves off a faction. Usually people dismiss this as just a goof, and don’t take it too seriously, but it costs people games constantly. If you want to learn more about sequencing power properly check out this podcast I did with SirRhino. It is usually correct to draw cards first before you make any other decisions with the rest of your turn. If you draw cards first you get to make better decisions around playing the correct power, using your removal appropriately, or even whether to attack or block. Here is a classic example: someone playing Hooru Control or Chalice Control on turn 5 will play Vanquish on their opponent’s Titan and then hold up Wisdom to play at the end of the opponent’s turn. The may not seem like a mistake, but it is. What if you drew into a Harsh Rule that you want to use next turn? Surely you would rather hold the Vanquish for latter in the game. Knowing you have access to a card like Harsh Rule will totally reshape your decisions, and you gain very little from the cleverness of using Wisdom as a fast spell. Maybe you still want to cast the Vanquish, but at least you had full information before making that choice! Line up the correct removal with the correct threats. Sometimes you need to precisely match correct removal with the correct threats, in which case you need to ration universal answers like Deathstrike and Slay over situational spells like Vanquish or Banish. Sometimes you need to prioritize power efficiency so you will fire off a 3-or-4 cost removal spell at a 2-cost unit so that next turn you can play 2 cards. These decisions are not easy, and will often determine the outcome of a game. Always be mindful of the most threatening cards from your opponent’s deck, and sequence accordingly. When I first read Chapin’s book I didn’t really believe this. Now, I am pretty convinced it is true for both Magic and Eternal, and sequencing plays properly is the backbone of correct technical play. The other side of good technical play is…. This topic is extremely dense and nuanced, so this particular discussion of the topic will be pretty quick-and-dirty. First I am going to talk about why plans are important, followed by a description of the 3 most basic styles of game plan, and then a short note about switching plans. In our case we can say choosing the wrong plan = game loss. It is impossible to go through all the possible plans that are available given that many decks have their individual tactics and tricks that constitute an individual plan. It is pretty easy to speak about three general strategies, and what they entail. Playing for damage – if you are an aggressive deck you are supposed to try and hit your opponent in the face as hard as you can as fast as you can. You win the game when they run out of life points, so that is your focus. This may sound mind numbingly obvious, but a lot of aggro players in lower levels of the ladder are too conservative. For example, you have a hand full of 2/1s for one when you are on the draw and your opponent plays a turn 2 Temple Scribe. It is true that it feels bad to trade a card with a “free” card from your opponent, but you need to kill them! I have played games where my Temple Scribe, Amber Acolyte or Dark Wisp is essentially just Moat. YOU NEED TO KILL YOUR OPPONENT! Other important mistakes of aggressive decks include using combat tricks to trade with large units when you should instead be pushing damage so you can win with burn, or holding back units from potential sweepers when you would just lose to that sweeper anyway. You came here to kill people, so you may-as-well mean it! A very related plan is playing to prevent damage as a control deck. Sometimes you need to take a break from drawing cards to actually affect the board. Sometimes you need to chump block when you would rather be value trading. Just because you are a control deck doesn’t mean you always get to play for value. It is very easy to become overly focused on getting two-for-ones or durdling when instead you need to keep yourself out of burn range. Playing for value – if you are not trying to kill your opponent, and there is no imminent danger of them killing you, you should probably be trying to out-value them. A natural impulse that many people have is to play out any cards that they can cast, but in a control mirror this is often wrong. Take for example the Feln Control mirror. It drives me nutty that people play out Feln Bloodcasters on turn 3. Are you planning to kill your opponent with your 2/5? Bloodcaster beatdown? If you hold it until 10-power you can actually guarantee it draws cards off the ultimate ability. Another egregious example is Armory players that jam Sword of Icaria on turn 3 with no follow up or protection in the mirror. Your opponent is very likely to just use their weapon to eat this for free, and all you will have is a single warcry trigger for your trouble. It is sometimes right to do this (for example if you have 2 more weapons in hand that cost 4 or less) but it is usually a pretty bad mistake. The most important lesson here is that playing for max value sometimes means doing nothing even though you have available power. Assembling Combinations – I can’t quite think of a title for this that doesn’t make it sound like I am talking about actual combo decks. It is true that there are some combos in the game that win the game on the spot, but that is not exactly common. Instead, what I am talking about is two card “combos” that are really hard to beat. Barthollo + Lethrai Falchion was and important “combo” that Argenport Midrange needed to assemble to beat Fire aggro. Scouting Party + Obelisk is a “combo” in a number of go-wide decks. Dawnwalker + Xenan Initiation is a very important “combo” in a number of Time midrange decks. Assembling these pairs of cards can be essential for prevailing in various match ups. Argenport Midrange really struggled against a number of aggressive decks, but the Bart/Falchion “combo” gave them a powerful alternative plan that often scored them wins where nothing else could. It is important to identifying what combos your deck has access to that provide it an alternative line of play beyond the basic lines of playing for value or playing for tempo. It is also important to know how important these plans are for the various match ups. The Dawnwalker + Initiation “combo” is back breaking against something like Rakano, but pretty unexciting against Feln Control. Understanding the importance and efficacy of these plans in different match ups will make a big difference in how much effort you put into setting them up or whether to pursue them at all. Switching plans – in my opinion this is the most difficult part of card games. As a control deck you sometimes need to switch to damage mode once you get into burn range, or if your opponent has a recursive threat you cannot really deal with (Makto for example). Sometimes the aggressive deck can slam on the breaks and switch to out-valuing their control opponent. Identifying when these situations come up, and how to transition, is extremely difficult, but there are a few tips I can give. First, you should think through which cards actually allow you to switch roles. A deck like Bandit Queen doesn’t really have the tools to switch to value mode, but an aggressive Combrei deck can comfortably grind their opponent out with Siraf under the correct circumstances. Feln Control is not known for its aggressive prowess, but if you can play out an aegis Champion of Cunning on curve you can kill people pretty quickly. Current iterations of Xenan Killers are a really good example of a deck that needs to constantly reassess its plans and shift between various approaches to the game. Argenport Instigator is a fairly aggressive card, but basically everything else in the deck can be used to push damage or push value. The best pilots of that deck are able to navigate between battle plans on a moment-to-moment basis, often needing to switch quickly between various plans depending on what they see from their opponent and what they draw. It is very difficult to give hard-and-fast rules for every possible deck, but I would say the most important part is identifying which cards (or combination of cards) let you switch plans. Once those show up in your hand you can ask yourself if now is the time to change tact. To end with, I actually want to address the idea that not everyone wants to get better. Are you someone who like to jam jank decks or wild brews for a couple hours a week? Do you prefer watching to playing? Does your schedule not allow for committing much to the game? Are you satisfied with your Gold or Diamond finishes? There is nothing wrong with that. You are probably not going to get better at Eternal (or card games in general) but that is not what everyone is here for. I personally find the constant push for self-improvement satisfying, but to someone else that might just look like hard work. At the end of the day this is a game, and people are free to interact with it how they like. Do you think these tips are helpful? Is there other general advice you have come across that encouraged you to improve? Have thoughts on practicing, tilt, or anything else? Share your thoughts in the Reddit thread! Thanks so much for joining, and I will catch you all later. PS There are some weird philosophical implication if you take the concept of “perfect play” to the extreme. Imagine that you had two supercomputers that are both perfect at Eternal facing off against one another. Every game would be entirely determined by the configuration of cards in each deck, and neither player would be able to get an edge over the other because of skill. If you exclude the impact of random effects like Siraf and Knucklebones, you could theoretically compute the winner of every game as soon as the cards are drawn. Viewed in this light, you could think games are entirely luck. Computer A has a 0% chance to win from turn 0, while Computer B has a 100% chance to win. This means that unless my opponent makes a mistake there are a lot of games I am doomed to lose, and that fate is entirely decided by the random number generator of the game engine. There is no way to outplay an opponent in a game with deterministic outcome. In this view, it seems like Eternal requires no skill. The flaw in this line of thinking involves assuming your opponent plays perfectly. Many of the “Eternal is all luck” posts seem to assume all players are playing close to perfectly, and that the only way to get an advantage in terms of skill is if your opponent somehow make a visible mistake that you can take advantage of. You get to some weird places when you embrace this logic. When opponents screw up they deserve what they get, but that is an outlier, because opponents are supposed to play perfectly, or I was predestined to win because that is what the order of the cards said. When I lose it is because I was in one of those game states where I had a 0% chance to win. Obviously the flavor of some “Eternal is all luck” posts goes more along the vein “my opponent played badly and I lost anyway”. In that case I would point to my article on variance in card games, as I think it does a good job of explaining why trying to eliminate all feel-bad situations is both impossible and ill-advised. It is part of the genre of the game, so you either need to accept it, or find something else to play. It is actually quite interesting to consider the “metaphysics” of card games, as the big-picture position we are in is actually quite curious. It is very easy to become frustrated when you feel like you played well but lost anyway, and I don’t blame anyone for feeling that way. 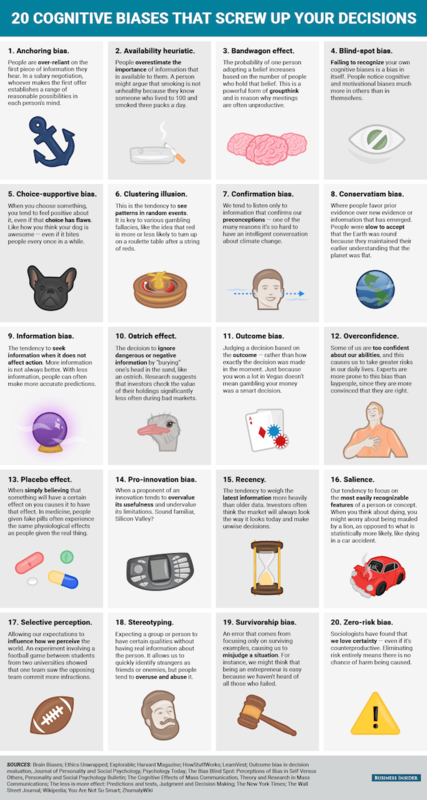 It is also easy to succumb to cognitive biases such as the availability heuristic, the overconfidence bias and recency bias (look below for a graphic that summarizes a number of cognitive biases). Card games are a weird combination of deterministic outcomes, a virtually impenetrable network of probabilities, all mixed in with subjective experience. You should be careful to oversimplify things with statements like “it is all luck”. PPS If there is anyone out there who is actively interested in paid coaching from me hit me up on Discord. It is something I am open to doing it anyone is actively interested.